If you want to witness the wrath of a river and everything it leaves behind in its wake, you have to visit the wonder that is the Grand Canyon National Park in Arizona. The once mighty Colorado River carved this 227-river-mile (446 kilometers) canyon over millions of years as the Colorado Plateau experienced a tectonic uplift. If time permits, make a pit-stop at the Hoover dam near Boulder, Nevada. An engineering marvel built during the great depression to generate hydroelectric power, control floods, and reserve water for the state of Nevada, Arizona and California. Try to climb up the Tillman – Callaghan memorial bridge to get exquisite views of the structure. Hoover dam is the perfect juxtaposition between the ingenuousness of man and nature’s might. The Arizonian desert landscape offers towering cacti foliage, rusty auburn earth, and desert vipers which immediately remind you of the wild wild west! 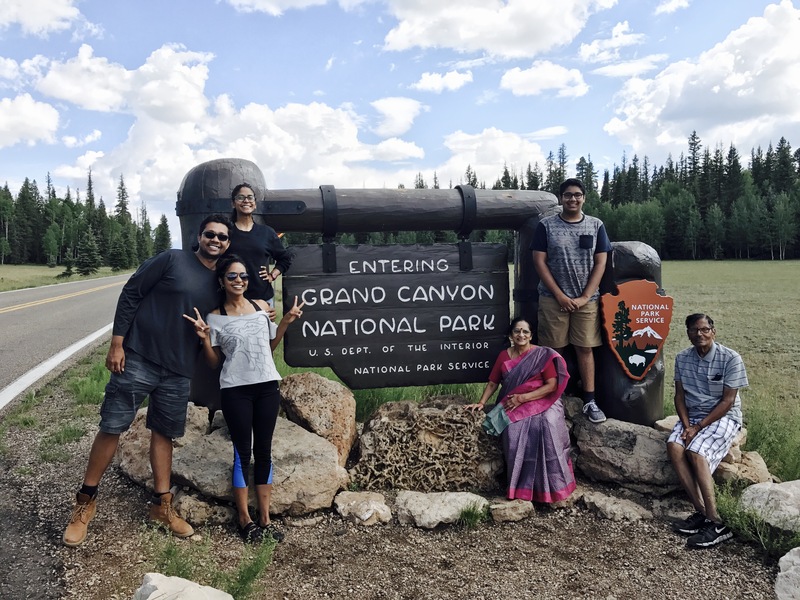 Upon reaching the National Park Visitor center, you are bused to the South Rim giving you a feel for spectacular vistas all along and the anticipation of seeing the expanse that is the Grand Canyon. Of course, one of the most fun ways to experience the Grand Canyon is via helicopter tours that provide a bird’s-eye view of the iconic landmark. But that’s nothing compared to what astronauts see as they zip over northern Arizona in the International Space Station. Pic courtesy: ISS. When we visited the first time as students, both of these options were out of reach. So the Grand canyon glass skywalk had to suffice. Walking on reinforced glass looking down below at fatal depths of the canyon is nerve-wrecking to say the least but totally worth the thrill. And NO, cameras are not allowed on the Skywalk. #AvoidStupidSelfieDeaths. Most of the commercial activity at the visitor center directly employs native Indian tribes. Grand Canyon is the homeland and a sacred place to numerous tribes offering us an opportunity to remember the powerful and spiritual ties between ancient peoples and places they inhabited before ‘civilization’ took over. On the drive back, i couldn’t help but wonder how some places on earth have the incredible power to move and inspire you. They urge you to protect lands that are a testament to unique relationships that man and nature have shared for millennia. Standing on the edge of the Grand Canyon reminded me of how insignificant we all are in the grand scheme of things. The only significant thing we can do is to take steps towards living in harmony with the only home we all know, our beautiful planet earth. We recently, visited Grand Canyon, yet again! My grandfather who is the most adventurous person alive at 80+ wants to see the whole world and every single place in it. Grand Canyon has been on his wishlist for ever, and so we took him there! Kudos to my grandpa and grandma who endured the 10 day trip across four national parks! This time to the North rim which was equally mesmerizing. The awe and sentiments mentioned in the post above stand tall and deep. Just updating some new clicks from July 2017. Check out the previous post on Shenandoah National Park, Virginia! Coming up next, road tripping along US 1 to Acadia National Park, Maine! Previous Shenandoah National Park – Spectacular Fall colors! Next Acadia National Park – The Jewel of the North East! Pingback: Acadia National Park – 3 of 59 – Life on a post-it! Pingback: Arches National Park – 4 of 59 – Life on a post-it!